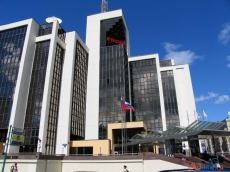 Russia’s Lukoil company will finance the project to extend additional financing for its share in the second stage of the development of Azerbaijan’s Shah Deniz field with internal cash flow, instead of borrowing from the European Bank for Reconstruction and Development (EBRD), the Bank told Trend. The process of disbursing loan by EBRD to LUKOIL Overseas Shah Deniz Ltd has been cancelled, according to the information on the Bank’s website. "At a time, when the transaction was structured, hydrocarbon prices were lower than they are at the moment. The prices picked up later, which brought Lukoil to the conclusion that the project could be financed from the internal cash flow and there was no need for external borrowings. The project was cancelled as a result," said EBRD. The project envisaged provision of a loan to LUKOIL Overseas Shah Deniz Ltd to extend additional financing for its share in the second stage of the development of Shah Deniz, an offshore gas exploration and production project in Azerbaijan and one of the largest gas fields in the world. LUKOIL has a 10 percent stake in the Shah Deniz field. EBRD was expected to provide $100 million worth loan for this project.